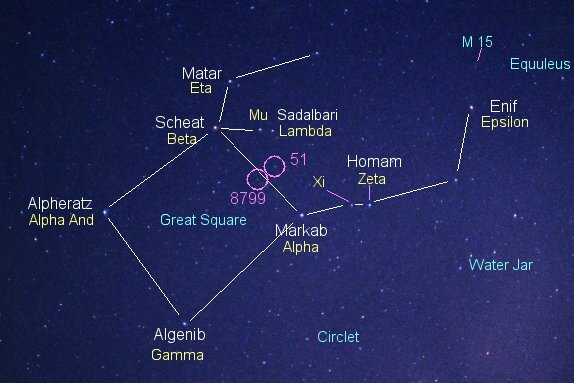 The upper circle shows the location of the sunlike class G star 51 Pegasi (in the constellation Pegasus). Its planet orbits in a mere 4.23 days (only 5 percent the period of Mercury around the Sun), has at least 0.47 times the mass of Jupiter, and is 0.05 astronomical units from the star. That is only 7.5 million kilometers, 4.6 million miles, or 13 percent Mercury's distance from the Sun. 51 Pegasi, 50 light years away, is a fifth magnitude (5.49, just short of sixth magnitude) star 1.3 times more luminous than the Sun. The class of the star is uncertain. It is sometimes listed as a G2 subgiant (a somewhat evolved kind of star with a temperature of 5800 Kelvin, about that of the Sun) and sometimes as a G5 ordinary dwarf, one that, like the Sun, fuses hydrogen into helium in its core. The planet is the first one found by the Doppler (velocity) technique. HR 8799 has three orbiting planets discovered by direct imaging.